"This small fragment on the top of the sarcophagus, from the beginning of the IV century, can be linked to the many maritime images that can often be found in ancient Greco-Roman art, and often used in the decoration of sarcophagi. One can see a boat with a slim prow and a low hull, navigated by a pilot with a full head of hair and rich clothing, while three rowers covered only with loincloths follow his orders. The ship moves over a choppy sea, while on the right one can just make out the remains of the base of a lighthouse. Inscriptions placed as captions next to the figures clarify the men’s identities: the pilot on the right is Iesus, Jesus - which can be guessed at from the iconography of the Apollinian face, even if vague - and the rowers who are instead, from left to right, Marcus, Lucas and Iojannes, the names of the three Evangelists, which leads us to expect for the sake of coherence, past the fracture, the presence of the fourth Evangelist, Matthew. 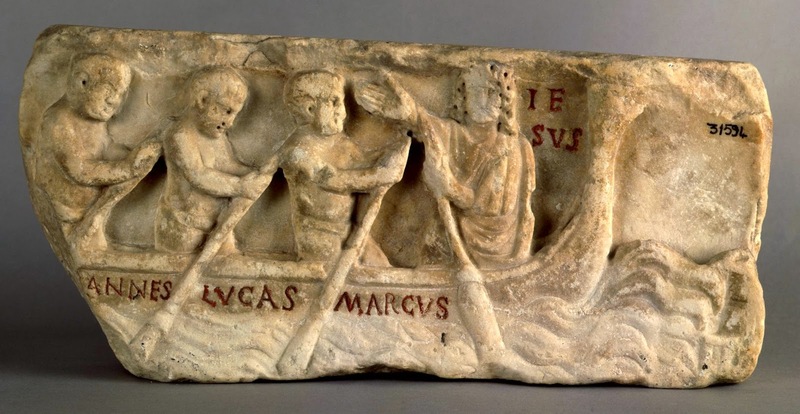 The generic boat which appears on many sarcophagi and on ancient inscriptions thus receives, on this fragment, its truest identity: in fact it represents the Church, who, like the ship in the calm after the storm (cf. Mt 8:23-27 et seq), “she is disquieted "in the sea," that is, in the world, "by the waves," that is, by persecutions and temptations; the Lord, through patience, sleeping as it were, until, roused in their last extremities by the prayers of the saints, He checks the world, and restores tranquillity to His own” (Tertullian, De Baptismo, 12, 8). In the Letter addressed to James (14:1), at the beginning of his Homeliae (1, 14), the author of the Pseudo-Clementines also states that “the entire body of the Church looks like a great ship, which transports men from faraway places in a violent storm”. He points out also that Christ is this ship’s pilot - as our fragment clearly shows - the bishop is the look-out, while the deacons, the priests and the catechists are the rowers. Even Hippolytus of Rome picks up (De antichristo, 59) the same analogy, restating that “the sea is the world; the Church, like a ship, is rocked by the currents, but not submerged: in fact it has an expert pilot, Christ”, while “it has the two Testaments as its rudders”. Other Fathers underline the meaning of the various parts of this ship, in particular referring to the main mast, which symbolizes by its shape the Cross, however we would like to underline here the reference to the Scriptures proposed by Hippolytus and the importance given by Clement, about the composition of the crew of the ship, to the catechists: these in fact teach the faith to the faithful, and primarily based on the Scripture and the Gospels, and are the true protagonists in the work of spreading and understanding the “good news” of salvation. The evangelists who push the boat guided by Christ, can not but refer to the invitation that Jesus addresses to His followers at the end of the evangelical story: “Go out to the whole world; proclaim the gospel to all creation. Whoever believes and is baptized will be saved” (Mk 16:15); “Go, therefore, make disciples of all nations; baptize them in the name of the Father and of the Son and of the Holy Spirit” (Mt 28:19). The boat rowed by the evangelists and guided by Christ to the port of salvation is also, in conclusion, an effective image of the unstoppable spreading of the Christian message (the kérygma, using a Greek word), of that evanghélion, the good news, which, when embraced leads to salvation (baptism, as the beginning of a new life), and which, thanks to the capillary spreading of the evangelical texts, was carried - truly by the ways of the sea - to the banks of the ancient world." Here is a Baroque rendering of the theme from Herman Saftleven illustrating a particular episode from Scripture: Jesus used Andrew and Peter's boat to preach to the crowds, and then led the fishermen to a miraculous catch of fish. Luke 5: 1-10 After this he called on them to be fishers of men.